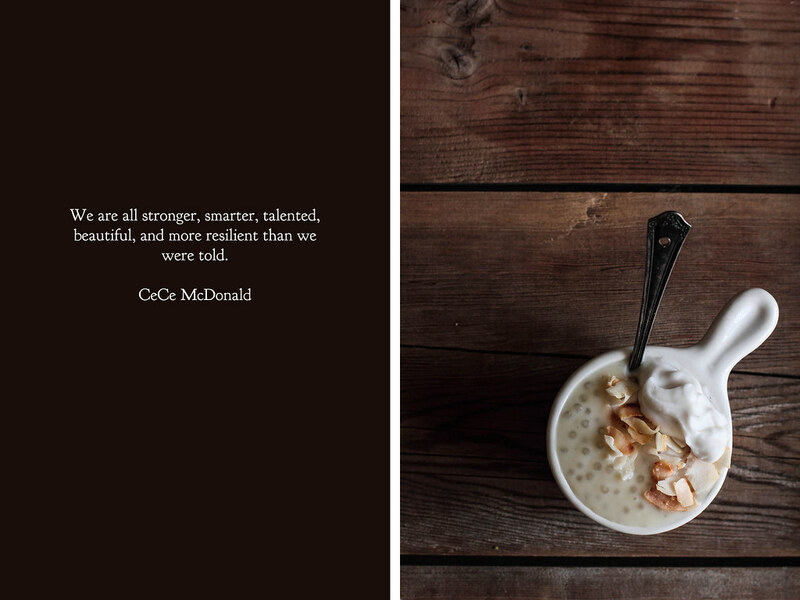 I admire the resilience of the coconut—the tough outer shell, the softer interior. It may not be a traditionally beautiful fruit, as it hides itself between layers of thick husk, but the brilliant white meat is worth the trouble. Coconut used to be a passing fancy for me, an afterthought more than a headlining ingredient. I would toss a few flakes in granola or a quick banana bread, but I never gave it much attention, or appreciated it for what it was. All of this changed when I was diagnosed as lactose intolerant, and I could not be more grateful for the coconut and its countless uses. When I was in Hawaii a couple years ago, I insisted on pulling the rental car to the side of the road to stop at a small fruit stand. One coconut, please, I requested. Since it was a quiet afternoon, the stand owner took some time to give me a little lesson in coconuts. After chopping through two with a hatchet, he allowed me to sip the water from each. Young coconut water was fizzy and refreshing. Old coconut water had a thick musky scent and flavor—not bad, but not terribly pleasant either. Then, it was time to taste the meat. For the young coconut, he handed me a plastic spoon. The young coconut flesh was so tender, so soft, it had the consistency of custard. The old coconut had the hard white flesh I was already familiar with. When the lesson was through, he packaged them up and sent me on my way. 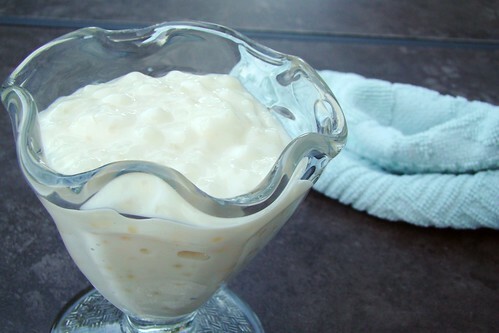 This coconut tapioca pudding combines coconut in three different forms. Rich coconut milk forms the base of the pudding. 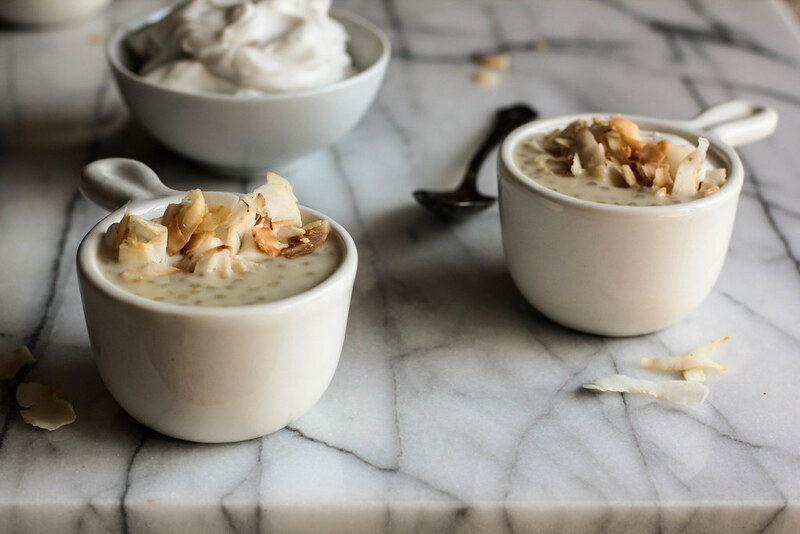 Whipped coconut cream, dolloped on top, provides a creamy thickness that is wonderful to eat between bites or to stir straight into the pudding. Lastly, a few flakes of toasted coconut are sprinkled on top, for flavor and for a pop of color. 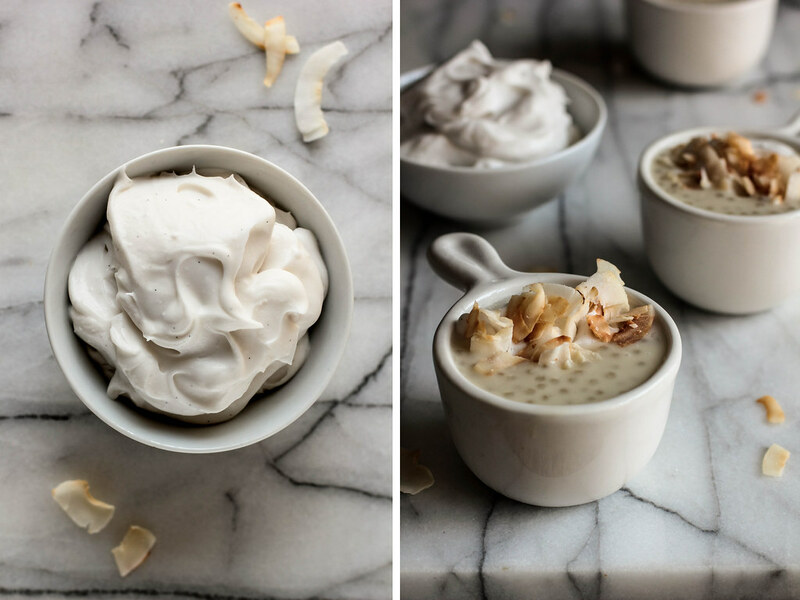 A trifecta of coconut, in pudding form. 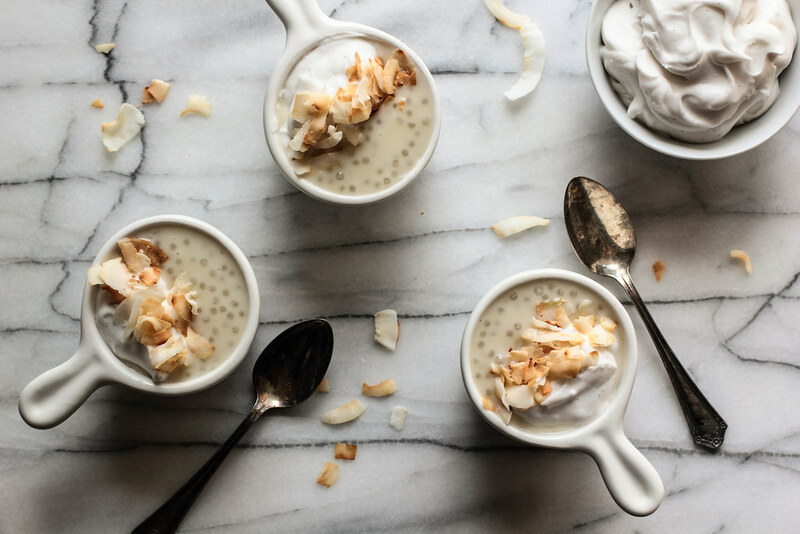 Coconut Tapioca Pudding is perfect for the unpredictable weather of spring. The pudding can be served warm or cold to suit the scene outside the window. 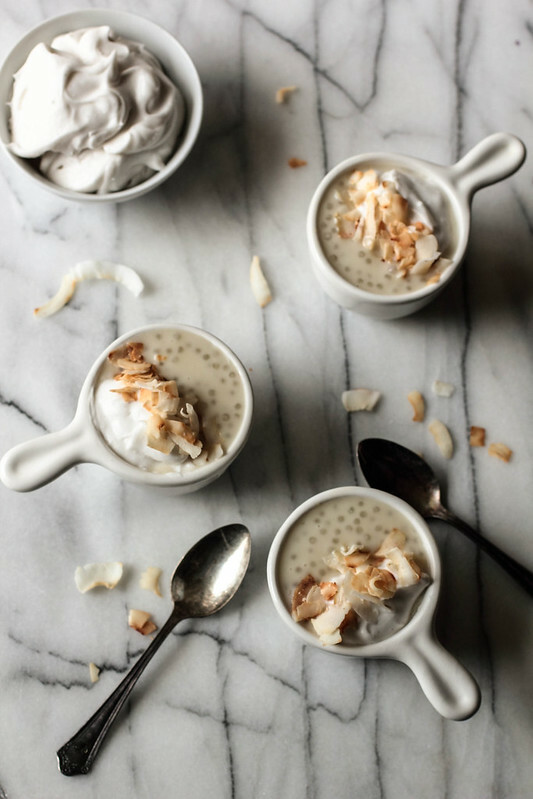 Coconut is the clear star of the dish, adding flavor in texture in three separate forms. This is a simple dish best served for afternoon pick-me-ups or lazy evening treats. I was first introduced to bubble tea two years ago. A friend had taken me to a tea house specifically to try it after finding out I was a bubble tea virgin. You've never tried bubble tea before? What's wrong with you? I was initially very wary of it, wondering why anyone would ever want to drink tapioca pearls through a straw. Weren't tapioca pearls supposed to be reserved for puddings? Nevertheless, I gathered up my courage and ordered myself a drink. One sip changed my mind. I suddenly wanted to put tapioca pearls in every drink imaginable. The pearls gave the bubble tea a texture that was unique and addicting. Since then, whenever I pass a shop that sells them, I can't resist buying myself a treat. Some people are addicted to coffee shops; I'm addicted to bubble tea houses. Luckily for my bank account (and unfortunately for everyone else), bubble tea houses are nearly impossible to find in the Midwest. However, as I've shown you before, they are very easy (and cheap!) to make at home. 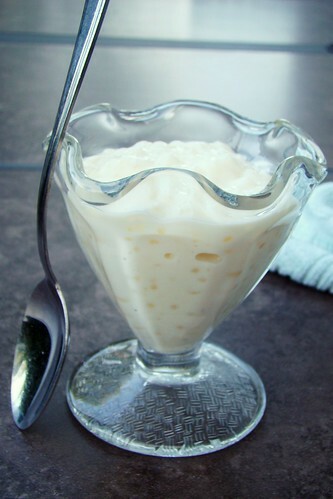 Regrettably, large tapioca pearls are one of those ingredients that are hard to find in supermarkets. You may spot them in the international aisle (very rarely the baking aisle), but, more often then not, they will elude you and your searching eyes. 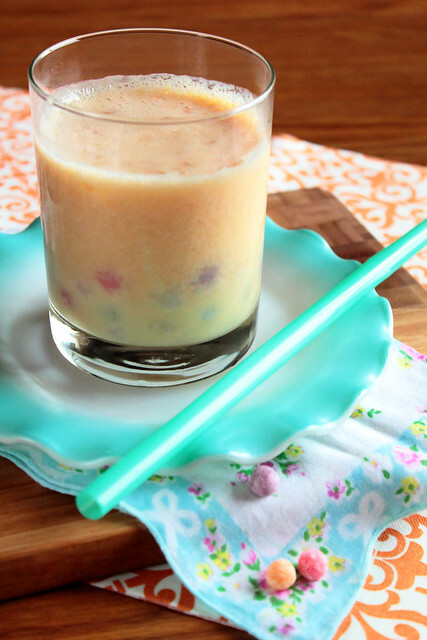 Luckily, bubble tea tapioca can be found in abundance at your local Asian market. If you can't find it there, or if you don't have a local Asian market, bubble tea tapioca can be found easily with a quick search on the internet. 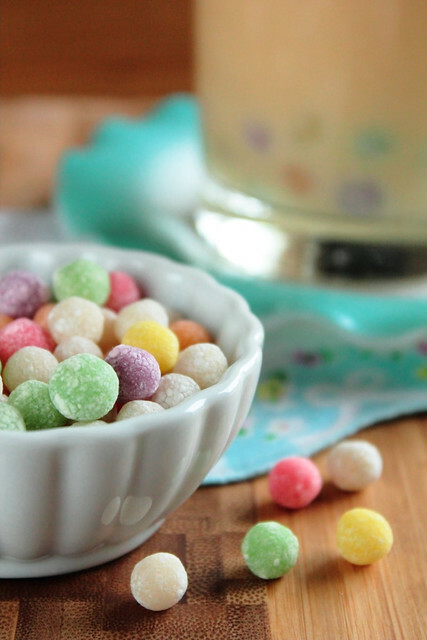 I've also seen the large tapioca pearls substituted for small jelly candies. Bubble teas are traditionally a low calorie drink but, if you don't mind upping the sugar content just a bit, you could easily chop up some fruit snacks or gummy bears and use those in place of the tapioca pearls. It is definitely a way to play around with multiple flavors in one drink. Though, if you're like me, you might just agree that the original is the best way to enjoy it. 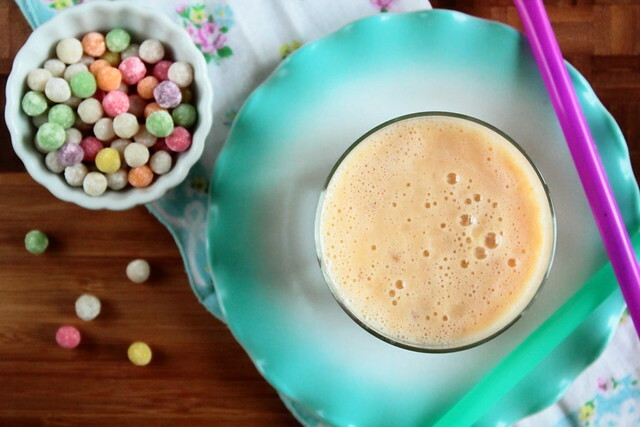 This Honey Peach Bubble Tea is very light, refreshing, and fruity. Honey and peach are two of those flavors that were meant to be together—they complement each other well. The black tea is actually quite hidden in this drink, making it taste more like rich smoothie than a tea (all while keeping the calories down!). 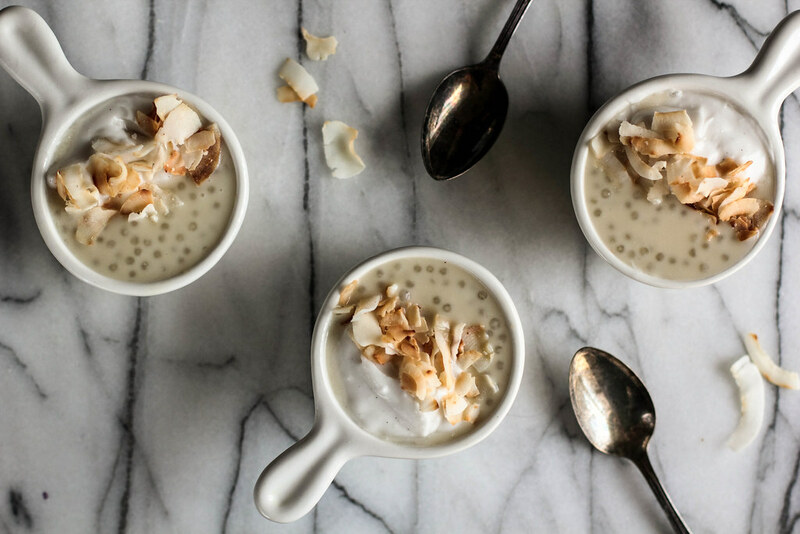 The tapioca pearls are perfect in a drink like this, giving it an interesting texture and a twist on the traditional beverage.